Well here we are back again, the weekend just gone was so busy. I dont know about you but there just never seems to be eneough hours in the weekend to get everything done. I always seem to have a TO DO list. This weekend was no exception! I realise that we are lucky in that we have a large garden and although I love having the space to do all the lovely things we do I still like to have corners to hide away in, and this year I was determined to transform my corner – making a table was the first thing to be done. 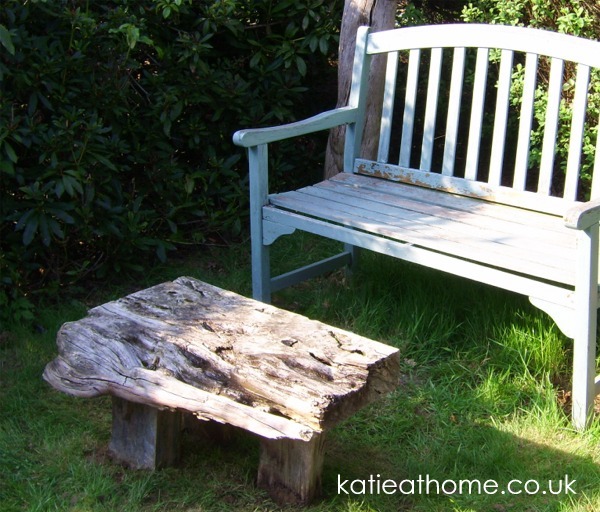 How to make a garden table . . this is how I did it. . . 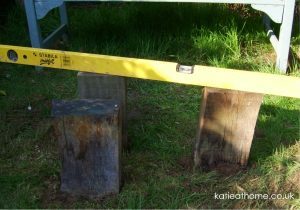 The table is a large slab of wood which I found in the field when we moved in – resting on three posts. First I dug some holes in the grass where I wanted the posts to go and then I moved the posts. Then using a spirit level made sure that the all three posts were level. Next I filled in the spaces around them and secured them in place. To finish I filled one of my tlite holders with some flowers and there we have it – a few more bits and peices to do and my corner will soon be complete.